3 April 1926: Virgil Ivan Grissom was born at Mitchell, Indiana, the second of five children of Dennis David Grissom, an electrician, and Cecile King Grissom. “Gus” Grissom attended Mitchell High School, graduating in 1944. He was a member of the Hi-Y Club, the Camera Club, and the Signal Club. Upon graduation from high school. Virgil I. Grissom enlisted as an aviation cadet in the Air Corps, United States Army, at Fort Benjamin Harrison, Lawrence, Indiana, 9 August 1944. He was assigned to basic flight training at Sheppard Field, Texas, but the War came to an end before he could graduate as a pilot. Then reassigned as a clerk, he requested to be discharged from the Air Corps, which he was in November 1945. 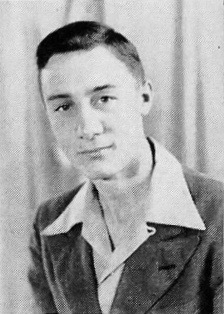 After the war, Grissom enrolled at Purdue University, Lafayette, Indiana, and in 1950, graduated with the degree of Bachelor of Science in Mechanical Engineering. He then re-joined the U.S. Air Force in 1950 and was trained at Randolph Air Force Base, Texas, and Williams Air Base, Arizona, where he specialized as a fighter pilot. He was commissioned as a second lieutenant, U.S. Air Force, in March 1952. Lieutenant Grissom was assigned to he 334th Fighter Interceptor Squadron, 4th Fighter Interceptor Wing, based at Kenpo Air Base (K-14), in the Republic of South Korea. He flew 100 combat missions in the North American Aviation F-86 Sabre. Grissom was promoted to first lieutenant, 11 March 1952. he requested to fly another 25 combat missions, but that was declined and he returned to the United States. Lieutenant Grissom was then assigned as a flight instructor at Bryan Air Force Base, Texas. Grissom attended a one year program at the Air Force Institute of Technology at Wright-Patterson Air Force Base, Dayton, Ohio, and earned a second bachelor’s degree in aircraft engineering. He was then sent to the Air Force Test Pilot School at Edwards Air Force Base, California (Class 56D). After completion, he was assigned as a fighter test pilot back at Wright-Patterson. 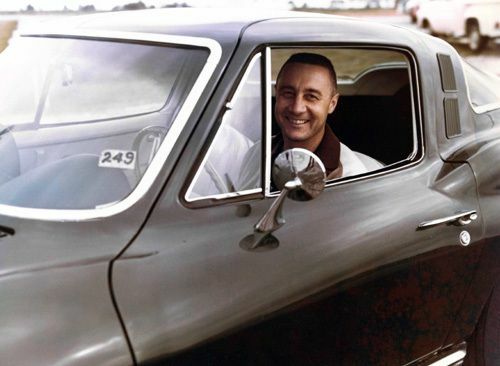 One of 508 pilots who were considered by NASA for Project Mercury, Gus Grissom was in the group of 110 that were asked to attend secret meetings for further evaluation. From that group, 32 went on with the selection process and finally 18 were recommended for the program. Grissom was one of the seven selected. 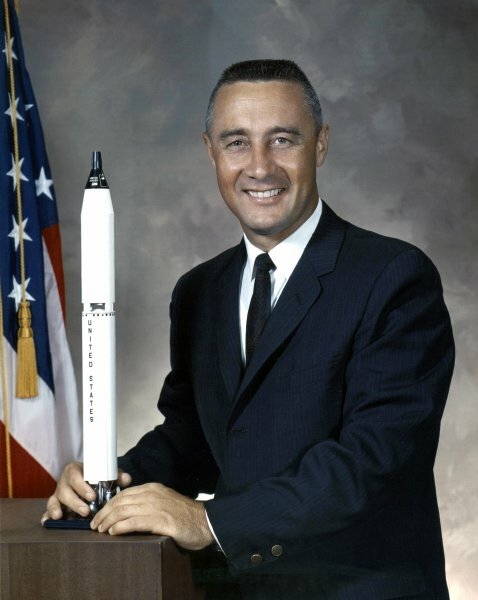 Major Grissom was the second American to “ride the rocket” aboard Mercury-Redstone 4. He named his space capsule Liberty Bell 7. The spacecraft reached a maximum altitude of 102.8 nautical miles (118.3 statute miles, 190.4 kilometers) and traveled 262.5 nautical miles (302.1 statute miles, 486.2 kilometers) down range. During the 15 minute, 37 second, flight, Grissom was weightless for 5:00 minutes. Next he orbited Earth as commander of Gemini III along with fellow astronaut John Young. He was back-up commander for Gemini VI-A, then went on to the Apollo Program. 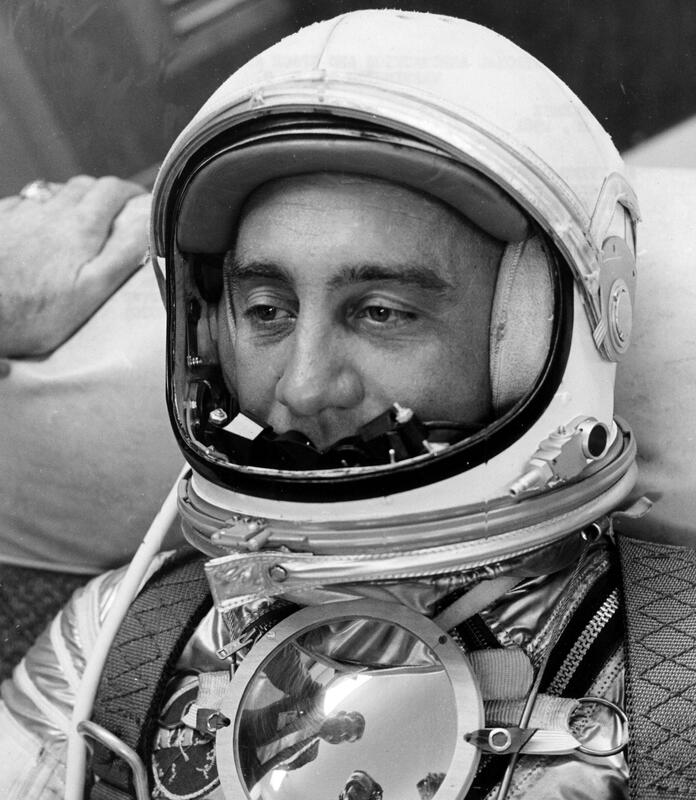 Gus Grissom was selected as the commander for Apollo I in January 1968. 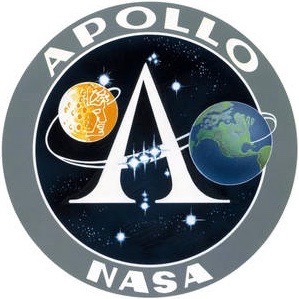 This was to be the first manned flight of the Apollo spacecraft. 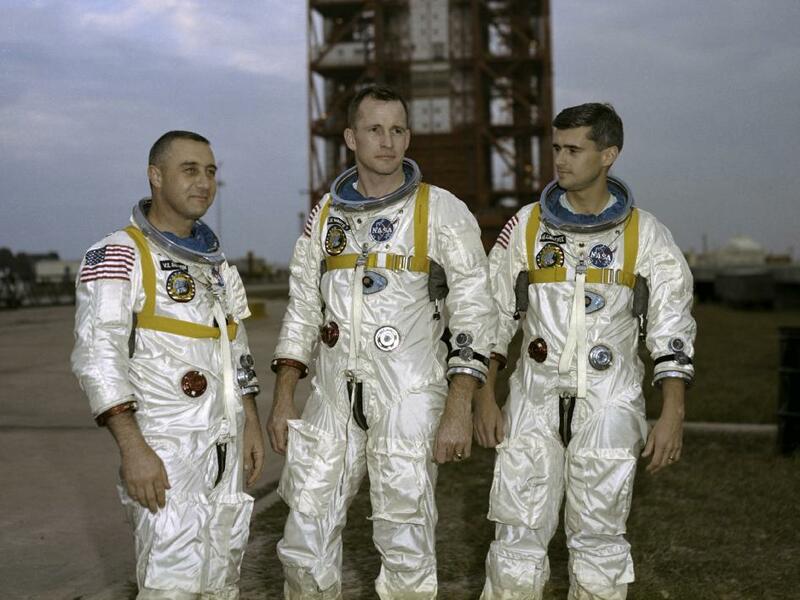 Ed White and Roger Chaffee were the other members of the flight crew. As commander of AS-204 (Apollo I), LCOL Virgil I. Grissom, USAF was killed along with Ed White and Roger Chafee during a test on the launchpad, 27 January 1967. Gus Grissom was an Air Force Command Astronaut with over 4,600 hours flight time. He was the first American astronaut to fly into space twice, and logged 5 hours, 7 minutes of space flight. For his military service, Grissom was awarded the Distinguished Flying Cross; the Air Medal with one bronze oak leaf cluster (two awards); the American Campaign medal; the World War II Victory Medal; teh Korean Service Medal; the United Nations Korea medal, and the Korean War Service Medal of the Republic of South Korea. For his NASA service, he was awarded the Congressional Space Medal of Honor (posthumous); the NASA Distinguished Service Medal (two awards); and the NASA Exceptional Service Medal. Had he lived, it is very possible that Grissom would have commanded the first Apollo mission to land on The Moon. The remains of Lieutenant Colonel Virgil Ivan Grissom, United States Air Force, NASA Astronaut, are buried at the Arlington National Cemetery, Arlington, Virginia. 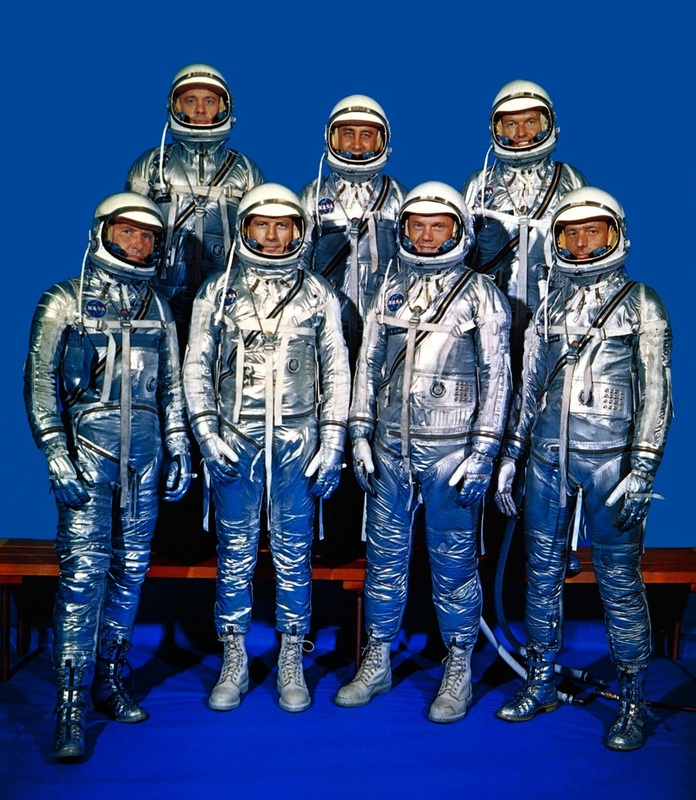 “The selection procedures for Project Mercury were directed by a NASA selection committee, consisting of Charles Donlan, a senior management engineer; Warren North, a test pilot engineer; Stanley White and William Argerson, flight surgeons; Allen Gamble and Robert Voas psychologists; and George Ruff and Edwin Levy, psychiatrists. The committee recognized that the unusual conditions associated with spaceflight are similar to those experienced by military test pilots. In January 1959, the committee received and screened 508 service records of a group of talented test pilots, from which 110 candidates were assembled. Less than one month later, through a variety of interviews and a battery of written tests, the NASA selection committee pared down this group to 32 candidates. 23 March 1965: At 14:24:00 UTC, Gemini III was launched aboard a Titan II GLV rocket from Launch Complex 19 at the Cape Kennedy Air Force Station, Cape Canaveral, Florida. Major Virgil I. (“Gus”) Grissom, United States Air Force, a Project Mercury veteran, was the Spacecraft Commander, and Lieutenant Commander John W. Young, United States Navy, was the pilot. 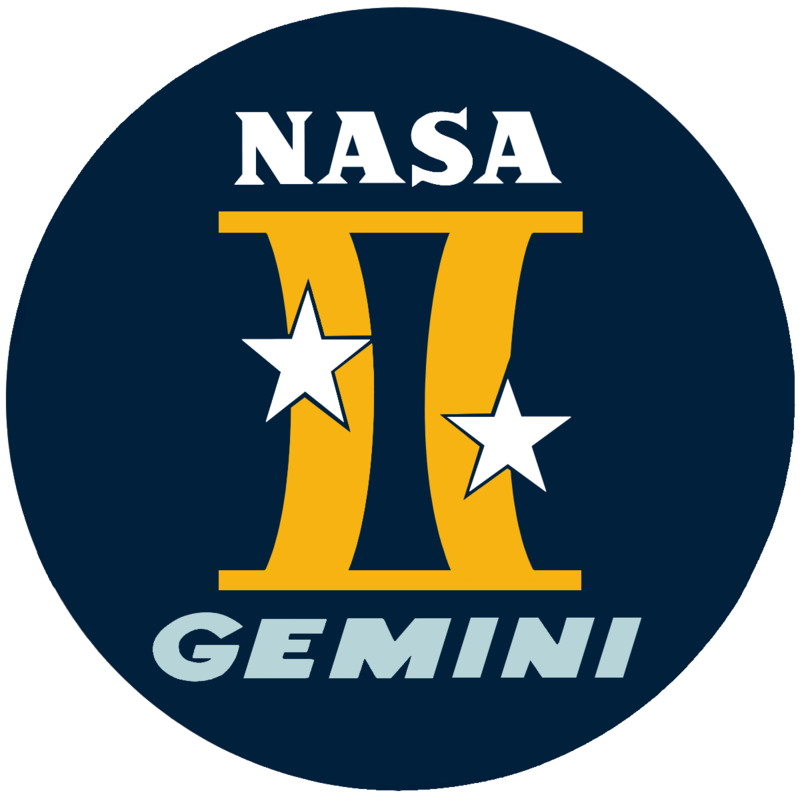 The purpose of the mission was to test spacecraft orbital maneuvering capabilities that would be necessary in later flights of the Gemini and Apollo programs. Gemini III made three orbits of the Earth, and splashed down after 4 hours, 52 minutes, 31 seconds. Miscalculations of the Gemini capsule’s aerodynamics caused the spacecraft to miss the intended splash down point by 50 miles (80 kilometers). 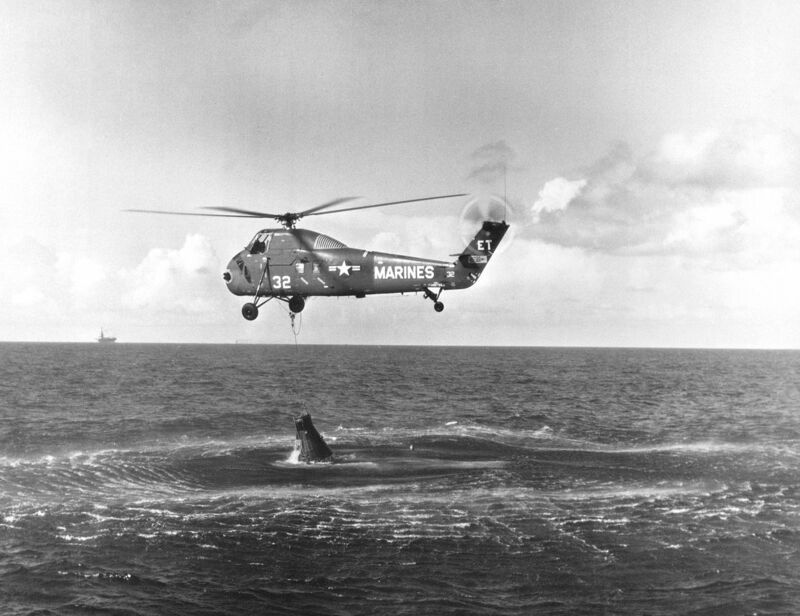 Gemini III splashed down in the Atlantic Ocean, north east of the Turks and Caicos Islands. The recovery ship was USS Intrepid (CV-11). 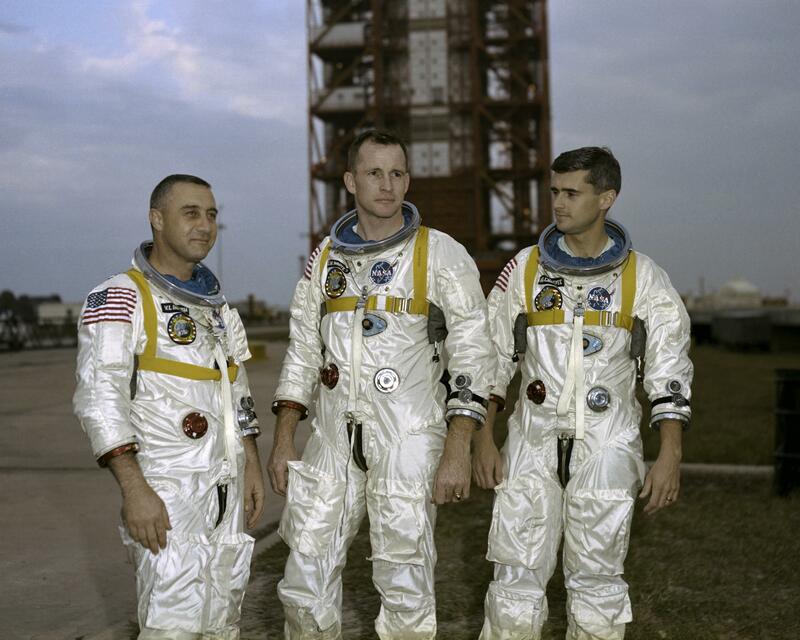 Gus Grissom would later command the flight crew of Apollo 1. He was killed with his crew during the tragic fire during a pre-launch test, 27 January 1967. John Young served as Spacecraft Commander for Gemini 10, Command Module Pilot on Apollo 10, back-up commander for Apollo 13, commander Apollo 16, and back-up commander for Apollo 17. Later, he was commander of the maiden flight of the space shuttle Columbia STS-1 and again for STS-9 and was in line to command STS-61J. The two-man Gemini spacecraft was built by the McDonnell Aircraft Corporation of St. Louis, the same company that built the earlier Mercury space capsule. 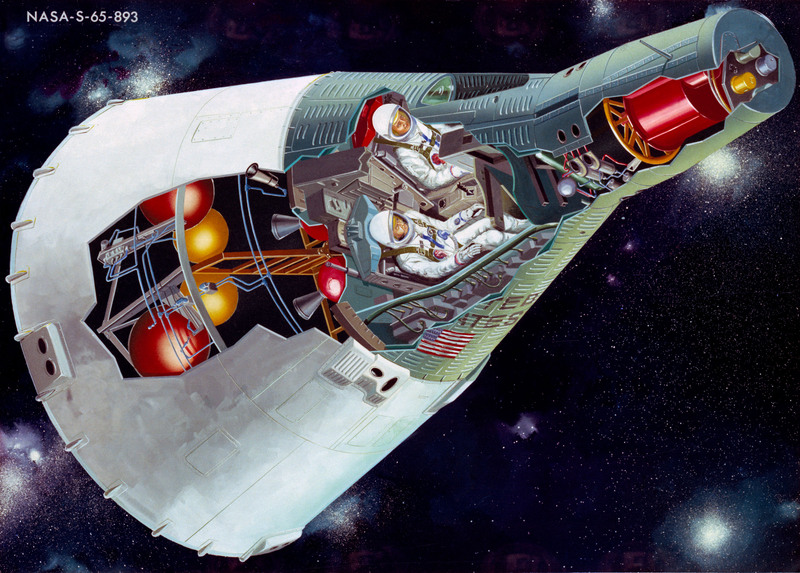 The spacecraft consisted of a reentry module and an adapter section. It had an overall length of 19 feet (5.791 meters) and a diameter of 10 feet (3.048 meters) at the base of the adapter section. The reentry module was 11 feet (3.353 meters) long with a diameter of 7.5 feet (2.347 meters). The weight of the Gemini varied from ship to ship but was approximately 7,000 pounds (3,175 kilograms). The Titan II GLV was a “man-rated” variant of the Martin SM-68B intercontinental ballistic missile. It was assembled at Martin’s Middle River, Maryland plant so as not to interfere with the production of the ICBM at Denver, Colorado. 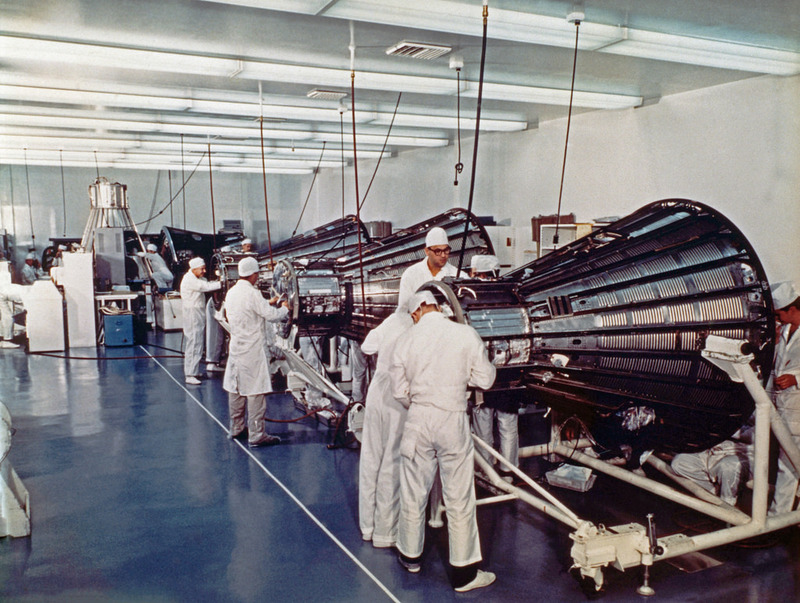 Twelve GLVs were ordered by the Air Force for the Gemini Program. 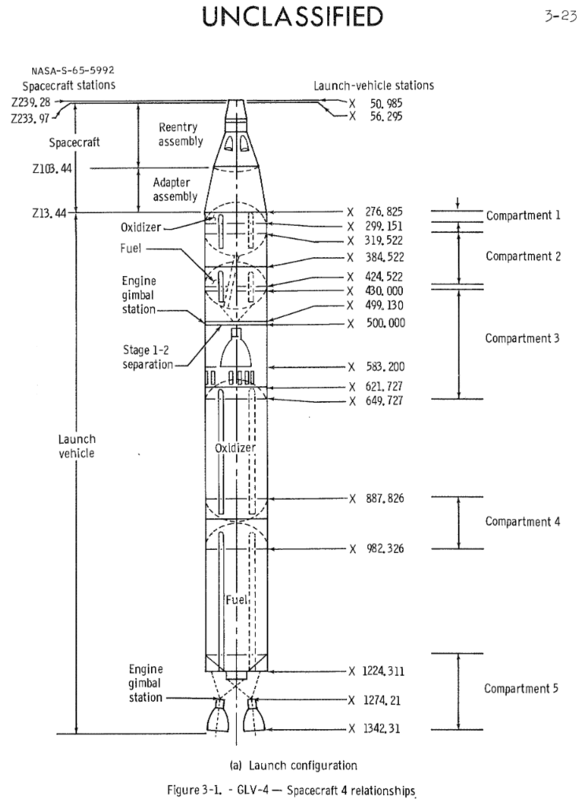 The Titan II GLV was a two-stage, liquid-fueled rocket. The first stage was 70 feet, 2.31 inches (21.395 meters) long with a diameter of 10 feet (3.048 meters). It was powered by an Aerojet Engineering Corporation LR87-7 engine which combined two combustion chambers and exhaust nozzles with a single turbopump unit. The engine was fueled by Aerozine 50, a hypergolic 51/47/2 blend of hydrazine, unsymetrical-dimethyl hydrazine, and water. Ignition occurred spontaneously as the components were combined in the combustion chambers. The LR87-7 produced approximately 430,000 pounds of thrust (1,912.74 kilonewtons). It was not throttled and could not be shut down and restarted. Post flight analysis indicated that the first stage engine of GLV-8 had produced an average of 461,080 pounds of thrust ( kilonewtons). The second stage was 25 feet, 6.375 inches (7.782 meters) long, with the same diameter, and used an Aerojet LR91 engine which produced approximately 100,000 pounds of thrust (444.82 kilonewtons), also burning Aerozine 50. GLV-7’s LR91 produced an average of 102,735 pounds of thrust ( kilonewtons). 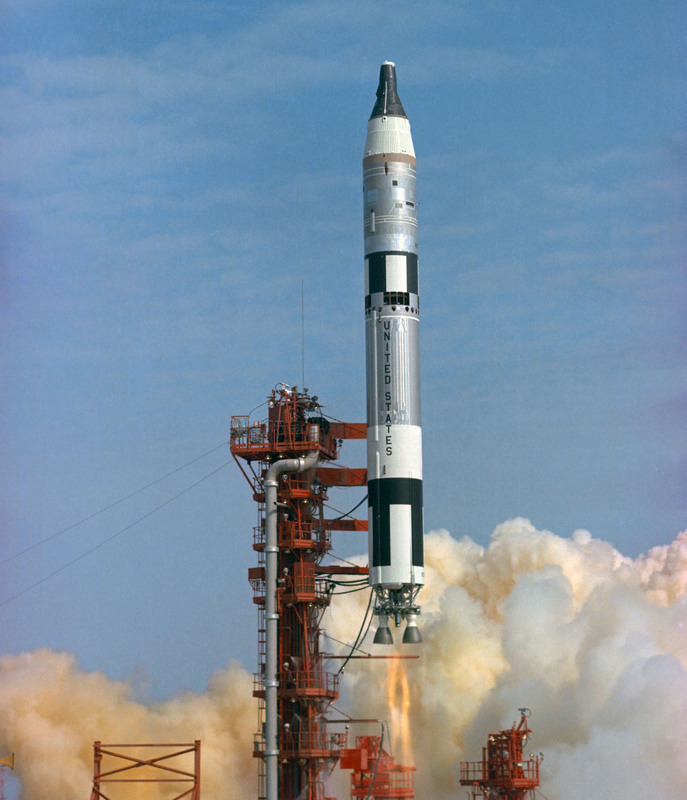 The Gemini III/Titan II GLV combination had a total height of 107 feet, 7.33 inches (32.795 meters) and weighed 340,000 pounds (156,652 kilograms) at ignition. The Gemini III spacecraft is displayed at the Grissom Memorial Museum, Spring Mill State Park, Mitchell, Indiana. 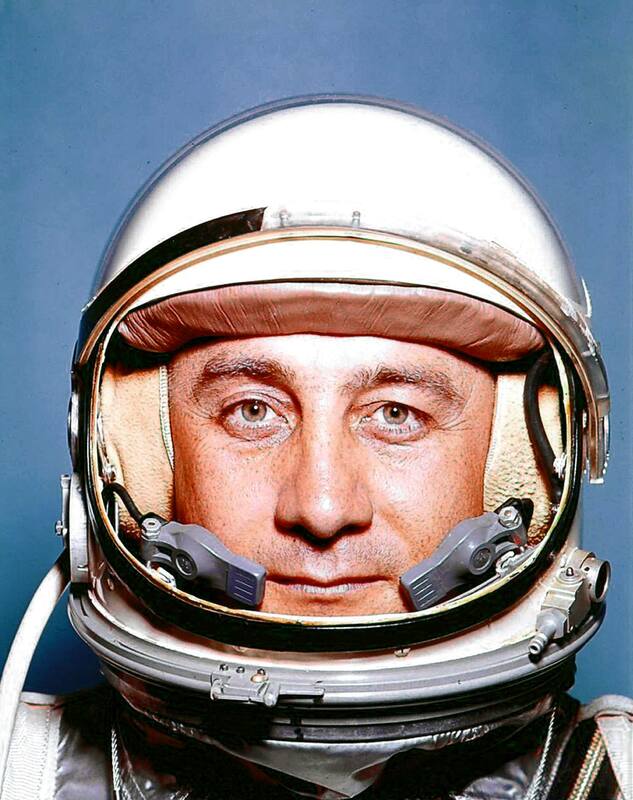 21 July 1961: At 7:20:36 a.m. Eastern Time (12:20:36 UTC), NASA Astronaut, Captain Virgil Ivan (“Gus”) Grissom, United States Air Force, was launched from Launch Complex 5, Cape Canaveral Air Force Station, Florida, aboard Mercury-Redstone 4. This was the second manned flight of Project Mercury. Grissom’s Mercury space craft was named Liberty Bell 7. The Mercury space craft was a one-man capsule built by McDonnell Aircraft. The Redstone launch vehicle was a highly-modified version of a liquid-fueled U.S. Army ballistic missile. The Redstone rocket accelerated to Mach 6.97 (5,168 miles per hour, 8,317 kilometers per hour). Grissom experienced a maximum 6.3 gs of acceleration on climbout.When the booster engine shut down, the Mercury capsule was released and continued upward on a ballistic trajectory. The peak altitude reached by Liberty Bell 7 was 102.8 nautical miles (118.3 statute miles, or 190.4 kilometers). The maximum velocity, relative to Earth, was 6,618 feet per second (2,017 meters per second). Grissom was “weightless” for 5.00 minutes. The capsule traveled downrange and landed in the Atlantic Ocean 262.5 nautical (302.1 statute miles, or 486.2 kilometers) from Cape Canaveral. During the reentry phase, the maximum deceleration of Liberty Bell 7 reached 11.1 gs. Total duration of the flight was 15 minutes, 37 seconds. Virgil Ivan Grissom was born at Mitchell, Indiana, the second of five children. Upon graduation from high school during World War II, he enlisted in the U.S. Army. After the war, he went to Purdue University and earned a Bachelor of Science Degree in engineering, then joined the U.S. Air Force and was trained as a fighter pilot. He flew 100 combat missions in the North American Aviation F-86 Sabre during the Korean War. He attended a one year program at the Air Force Institute of Technology and earned a second Bachelor’s degree in aircraft engineering. Next he went to the test pilot school at Edwards AFB. After completion, he was assigned as a fighter test pilot at Wright-Patterson AFB. Gus Grissom in the cockpit of his 1963 Corvette Stingray. Captain Grissom was the second American to “ride the rocket.” He named his space capsule Liberty Bell 7. 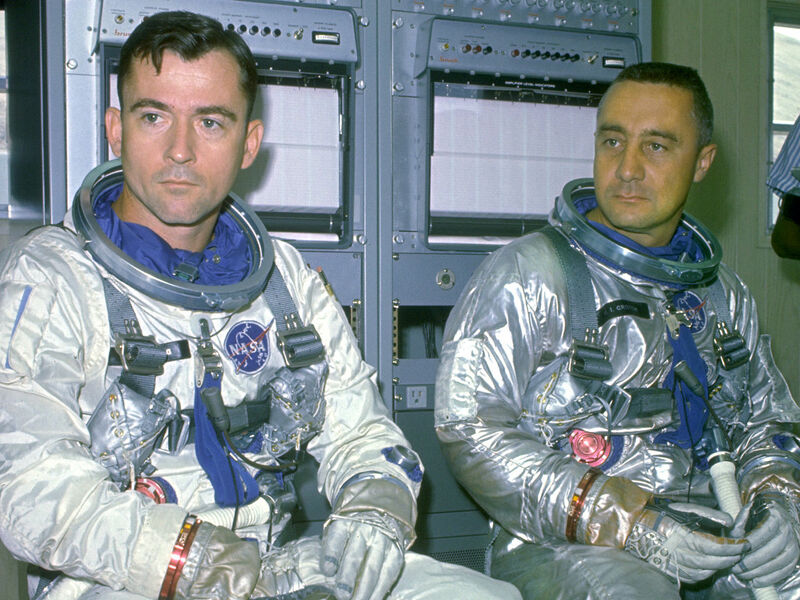 Next he orbited Earth as commander of Gemini III along with fellow astronaut John Young. He was back-up commander for Gemini VI-A, then went on to the Apollo Program. As commander of AS-204 (Apollo I), LCOL Virgil I. Grissom, USAF was killed along with Ed White and Roger Chafee in a disastrous launch pad fire, 27 January 1967. Gus Grissom was an Air Force Command Pilot with over 4,600 hours flight time. He was the first American astronaut to fly into space twice. Liberty Bell 7 (Mercury spacecraft number 11) differed from Alan Shepard’s Mercury capsule with the addition of a large viewing window and a side hatch equipped with explosive bolts. There were also differences in the capsule’s instrument panel, as well as other improvements. The MR-4 capsule was delivered to Cape Canaveral on 7 March 1961. The space capsule was truncated cone with sides angled 20° from the longitudinal axis. It was 6 feet, 10 inches (2.083 meters) long and had a maximum diameter of 6 feet, 2.50 inches (1.892 meters). The total height of the spacecraft, from the tip of the aero spike to the booster adapter, was 26 feet, 1.26 inches (7.957 meters). 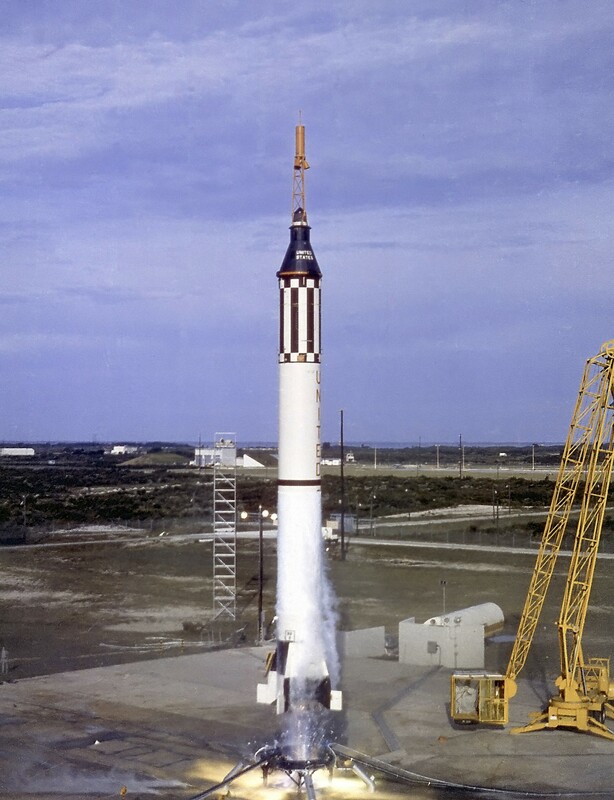 At launch, Mercury 11 weighed approximately 2,835 pounds (1,286 kilograms), empty. During flight outside the atmosphere, the Mercury spacecraft could be controlled in its pitch, roll and yaw axes by hydrogen peroxide-fueled reaction control thrusters. Both manual and automatic attitude control were available. It could not accelerate or decelerate (except for reentry) so it could not change its orbit. The spacecraft cabin was pressurized to 5.5 psi with 100% oxygen. The pilot wore a B.F. Goodrich Mark IV Model 3 Type I full-pressure suit and flight helmet for protection in the event that cabin pressure was lost. The Redstone MRLV was powered by a single NAA 75-110-A7 liquid-fueled engine built by the Rocketdyne Division of North American Aviation, Inc., at Canoga Park, California. The A7 produced 78,000 pounds of thrust (346.96 kilonewtons) at Sea Level, and 89,000 pounds (395.89 kilonewtons) in vacuum, burning ethyl alcohol with liquid oxygen. The total vehicle height of Mercury-Redstone 4, including the booster, adapter, capsule and escape tower, was 83.38 feet (25.414 meters). The total vehicle launch weight was approximately 66,000 pounds (29,937 kilograms). ² After retiring from military service, Sikorsky HUS-1 Seahorse Bu. No. 147755 (redesignated UH-34D in 1962) was sold to the civil market, and was registered N4216H, 10 March 1981. It was owned by Orlando Helicopter Airways, Inc., Orlando, Florida. The FAA registration was cancelled in 2013. The status of the helicopter is not known.